Scouring Stick Cleans Where Chemicals Fail With Gentle Abrasive Action. Heavy-Duty Design Scours Away Mineral Deposits, Rust, Stains And Scale From Sinks, Tubs, Showers And More. Scouring Stick Also Cleans Baked-On Food, Grease And Carbon Buildup In Ovens, On Grills And Iron Cookware. Scouring Stick Is Safe For Your Skin, Won'T Harm Hard Surfaces And Is Safe To Use Around Children And Pets..
Scouring Stick Cleans Where Chemicals Fail With Gentle Abrasive Action. Heavy-Duty Design Scours Away Mineral Deposits, Rust, Stains And Scale From Sinks, Tubs, Showers And More. Scouring Stick Also Cleans Baked-On Food, Grease And Carbon Buildup In Ovens, On Grills And Iron Cookware. 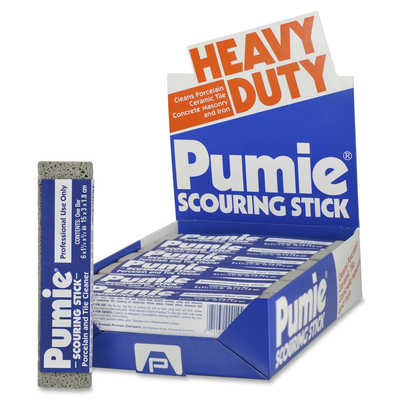 Scouring Stick Is Safe For Your Skin, Won'T Harm Hard Surfaces And Is Safe To Use Around Children And Pets.